Music meant little or nothing to me until I was sixteen. The only music I heard before then that struck a chord was the plain song that used to accompany public information films on monuments from the Middle Ages, such as Fountains Abbey, preserved by the Ministry of Works (but I never imagined you could acquire this on disc). Then one day I went to a Sixth Form musical appreciation class and the teacher played Stravinsky's 'Rite of Spring'. I was arrested - this was music - its vivid bringing forth an imagined world, its extraordinary rhythms and change of rhythm, its repetition and colour. I went home, raided the piggy bank, went and bought a recording. I only had an opportunity to play this on my brother's record player when he was out. I did whenever he went out (which was often) and after a week, my father entered the room, handed me a five pound note and said, 'Buy another record'! Today I went to the admirable Stonehill House to listen to Rosamund Bartlett, the Russian scholar and translator, talk about Stravinsky and Diaghilev. It was, as on a previous occasion on Chekov and Tolstoy, a highly accomplished performance including the first talk that was an artfully compressed digest of Russian cultural history, woven out of themes relevant to illuminating the revolution that was the Ballet Russe. Like many innovations it came from mining the old and combining it in radically new combinations. It reminded you too that innovation (even in art) is rarely the result of unique genius but of collaboration and of creative conflict. What I was reminded of was how conscious Diaghilev was of creating an image of Russia to offer the West and how, post-Revolution, the extraordinary impact of that offering was lost to the land of its origin. It was an 'eccentric' image - itself a product of Russia's own assimilation of an 'Oriental' image of itself - but one that briefly made Russia the avant garde of the cultural world. At the centre of this transfusion of cultural energy was Stravinsky. This most apparently cosmopolitan of Russian composers was arguably, at heart, the most Russian of composers. His career was launched by two works that reworked Russian folk traditions (of which he was deeply knowledgeable) and the third, that sealed it, the evocation of (an imagined) primitive Russian past; but, what Rosamund made beautifully clear that underlying all his work were the rhythms of Russian Orthodox chant. It was an underlying comparison I recall the composer, Sir John Tavener, making, in his own inimitable way, a few years ago as both musician and Orthodox believer. Oddly this chimes with my own adolescent intuition - finding something of the sacred rhythm of spared down forces in the parred down rhythms of Stravinsky's revolutionary music. It too was a connection recognised by two other members of the audience, a delightful couple, both of whom had been professional dancers, who had danced the Rite repeatedly in the course of their careers. Other things I came away with included a reminder of the extraordinary gifts of Diaghilev in marshalling such extraordinary talents into coherent wholes: no wonder it required a man of such self-confidence, ruthlessness, charm and energy (both his own and an ability to impart it to others). 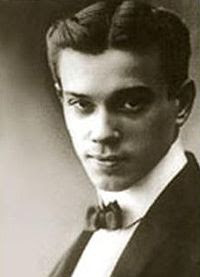 And what a stunner Nijinsky was: no wonder Diaghilev was besotted (though leaving an underlying ability to manipulate wholly intact) and dismissed him from the Ballet Russe on his marriage.